This chandelier is accompanied by a 7' chain and matching canopy. The decorative burlap chandelier pole shown in photo may be purchased separately through our lighting accessories. 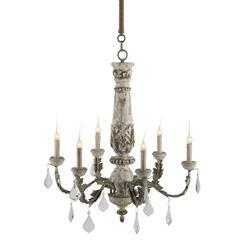 An aged antiqued grey finish adorns this handmade chandelier with sparking crystal drops. Intricate leaf carvings adorn the base and accent the iron arms in stunning detail.